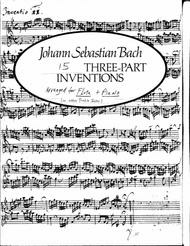 Originally for keyboard alone.This transcription separates the 3 voices,so that the bottom two can be played on a keyboard instrument while a trebleinstrument plays the top. Theoriginal has been transcribed for apiano to accompany a treble instrument like flute, violin, oboe, etc. The pianoscore has the "second voice" on treble and the "third voice"on the bass clef of the grand staff. The flute part is in a smaller size staffabove the piano grand staff. The user can use panning to either hear bothparts, or only the other player’s partas he practices. Allare in the original key. Violins and clarinets can play Sinfonia 15 in the original key of B minor, but theflute range doesn’t go low enough. So Sinfonia15 has an additional version transposed to E minor so that a flute can play thelow notes of the melody linewithout jumping octaves. Saxophones and other instruments can play the flute part without transposing if the accompanist has an electronic keyboard. to transpose the piano part. 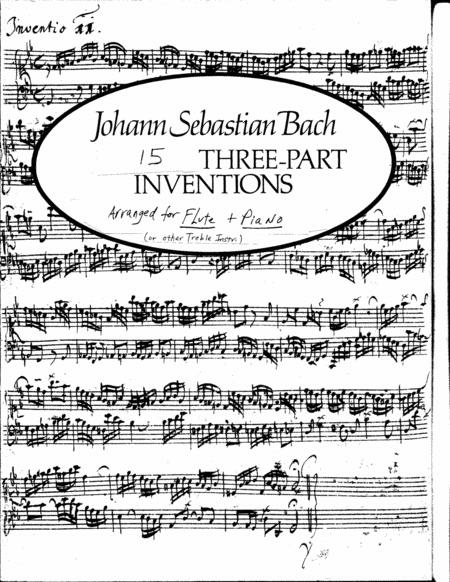 These pieces are a nice addition to the fluteor violin literature as study, encore, or concert pieces.